The suspected gunman was an Afghan-American who worked for a global security firm and may have had radical Islamic "leanings," officials say. ORLANDO, Fla. — A gunman wielding an military-style semi-automatic rifle opened fire inside a crowded gay nightclub in Orlando early Sunday killing at least 50 people - the worst mass shooting in U.S. history. The attack left another 53 people wounded at the Pulse club, according to Orlando's mayor, Buddy Dyer. The gunman was among the dead after a gunfight with SWAT officers, police said. The guman was identified as Omar S. Mateen, 29, a New York-born Afghan American who lived in Port St Lucie on Florida's east coast and worked for a global security firm, G4S. He reportedly pledged allegiance to the Islamic State (IS) militant group during the shooting, according to some media reports. Mateen's father, Seddique Mateen, is an Afghan exile who has posted bizarre videos in support for the Afghan Taliban, according to the Washington Post. However, U.S. officials say they have not yet turned up evidence of any direct connection with IS or any other foreign extremist group, according to Reuters. "We know enough to say this was an act of terror, an act of hate," President Barack Obama said in a speech from the White House. He added that the killer's precise motives were not immediately known. "We must spare no effort to determine what, if any, inspiration or association this killer may have had with terrorist groups," he said. The suspected gunman arrived at the club as it was about to close around 2 a.m., when more than 300 people were inside for a Latin themed night, officials said. The gunman opened fire and took hostages in a bathroom, Police Chief John Mina said. 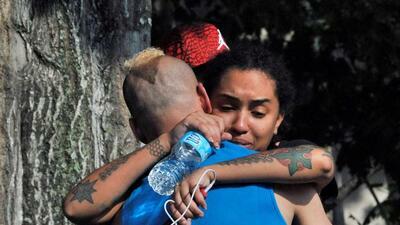 Many of the victims appear to be Hispanic, according to a police list. Javer Antonetti, 53, told the Orlando Sentinel newspaper that he was near the back of the dance club when he heard gunfire. "There were so many (shots), at least 40," he said. "I saw two guys and it was constant, like 'pow, pow, pow,'." After a three hour stand-off a SWAT team burst into the club to rescue hostages, Mina said. A woman who was outside the dance club early Sunday said her 30-year-old son texted her from a bathroom where he was hiding with other club patrons. He then texted her: "'He has us, and he's going to kill us'" Mina Justice said. "That was the last conversation." The number of dead far surpassed previous mass shootings in the United Stataes. In 2007, a student killed 32 people at Virginia Tech University in Blacksburg, Va., before committing suicide. In 2012, a deranged young man shot dead 27 people, including 20 children, at Sandy Hook Elementary School in Newton, Conn..
Sunday's attack follows the fatal shooting late Friday of 22-year-old singer Christina Grimmie, who was killed after her concert in Orlando by a 27-year-old Florida man who later killed himself. Grimmie was a YouTube sensation and former contestant on "The Voice."